Forget everything you know about money-management plans. With Dave’s 7 Baby Steps, you don’t need a degree in finance to take control of your money. Anyone can do it! The Baby Steps show you exactly what to do as you pay off debt and build up your savings. With each step, you’ll start changing the way you handle money—little by little. 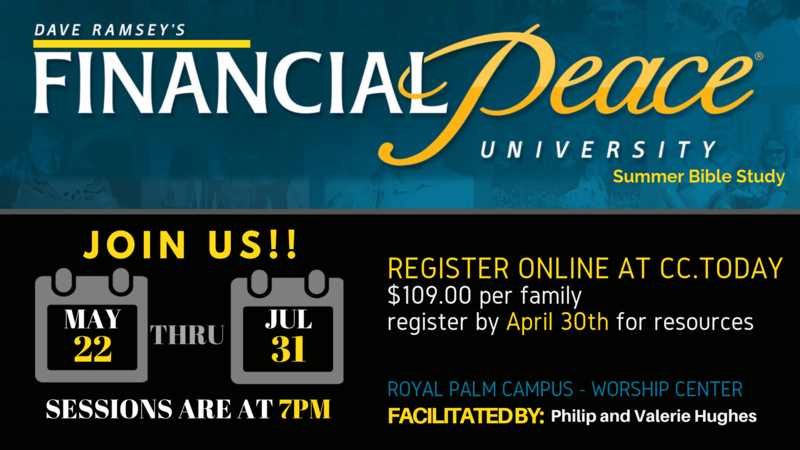 Never worry about money again with Financial Peace University (FPU)! It’s the proven plan to help you master budgeting, beat debt, and live the life of your dreams! FPU includes your member workbook and other exclusive online benefits through a free year of Financial Peace Membership. Join Philip and Val Hughes, as they facilitate this great easy to understand course about how to manage your money, and have financial peace!